SCVHistory.com | General Interest | SCV Switching to Direct-Dial, All-Number Calling, 1960. SCV Switching to Direct-Dial, All-Number Calling, 1960. This is How the Phone System Will Be. The Newhall Signal and Saugus Enterprise | Thursday, May 5, 1960. Telephone company activity in the Newhall exchange was given added thrust this week with announcement that telephones will be changed to dial operation on June 19. "The phone company is changing service here from manual-type operation to dial mainly because of growth," Jenner explained. "But it also wants its subscribers here to have the most modern, up-to-date service it's now possible to provide so they may be equipped for communications in the rapidly unfolding future." All Newhall exchange calls after June 18 will be switched automatically through the most modern dial equipment to be found in operation anywhere. It's called "crossbar." It has self-checking features that require little or no maintenance. It's located in the telephone company's new multi-million-dollar office building at 24705 Newhall Ave.
Western Electric Company technicians have been installing the new crossbar equipment since early last November. Jenner said an idea of its size may be appreciated by knowing that it has about 1,800 lattice work switches controlled by electromagnets, nearly 70,000 relays of all types and close to 29 million feet of wire — enough to stretch from coast to coast and back again. The crossbar machine also will be equipped with Automatic Message Accounting equipment — "simply, a means to record the technical details of all customers' calls (like the telephone number, an identity code, the answer and the disconnect time) that go to distant points. "This brings us to item number two: Direct Distance Dialing," Jenner said. "In the telephone company, if is referred to as DDD, what it does for telephone calling to distant points is a real marvel of modern communications." 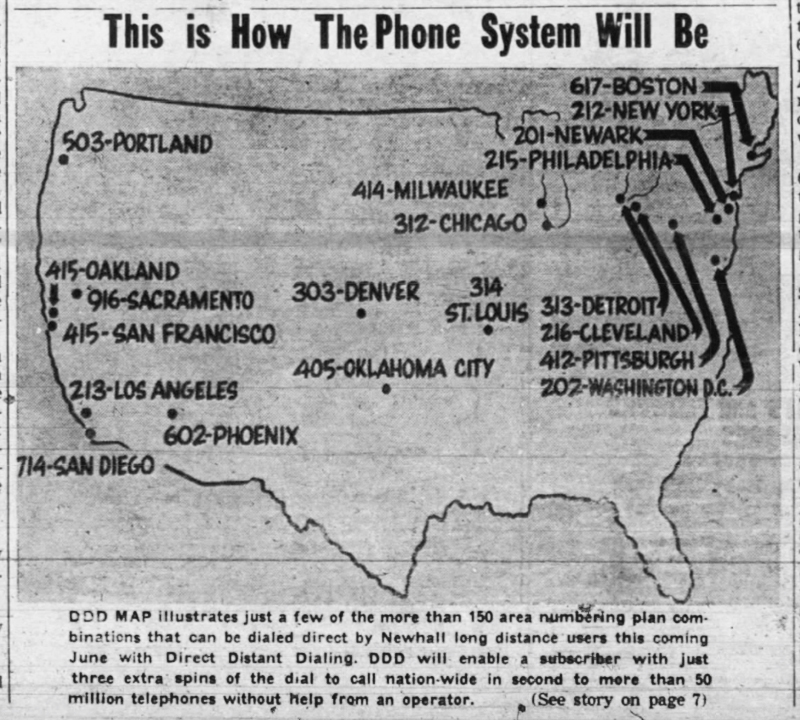 Newhall subscribers aren't the first to get DDD, but they're getting the added advantage of being able to dial, direct, without any assistance whatever from the operator, to any of more than 50 million telephones throughout the U.S. and Canada, the manager pointed out. "DDD is proven. And Newhall subscribers will benefit from its present and future scope," he said. The U.S. and Canada are now split into about 150 geographical areas. Each has a three-digit code number. Newhall falls in an area that is labeled "805." This means that folks elsewhere in the country whose phones are also equipped for DDD must first dial the code "805" if they want to dial a Newhall number direct. Los Angeles is in the "213" code area. Therefore, Newhall phone users who want to dial direct to an L.A. number would first dial 213 followed by a prefix, like MA, and five numerals. If the number is dialed correctly, the phone will ring and the called party will answer — all in a matter of a few seconds. Item three for Newhall subscribers is called "All Number Calling." This is the "latest" of all and has been introduced in only a few exchanges so far throughout the U.S.
"Basically, it means that Newhall telephones will be identified by numbers only," Jenner explained. He said there will be no letter and number combinations such as WI-4 in the Palmdale exchange. Several numerals will identify Newhall exchange phones. The first three always will be 259 followed by four more (259-XXXX). Eventually, all phones throughout the U.S. will be identified this way. The reason, in Jenner's word, is "growth." It's all tied-up with DDD, he said. Within each geographical code area, there are just so many usable prefixes that can be used. And there simply are not enough to care for the future. "If we go on the way we are going (using prefixes and numerals in telephone numbers), we're going to run dry in about 15 years," Jenner commented, "right here in Southern California." By changing phones to All Number Calling (all numerals, no prefixes), engineers estimate the numbering plan will not be outgrown until about the year 2000. (1) Faster dialing. Numbers, engineers have found through comprehensive tests, are easier to locate on the dial than are letters. Dialing seven digits is faster than locating and dialing two letters and five digits. (2) More accurate dialing — fewer wrong numbers. For example, All Number Calling eliminates confusions between the letter "O" and the numeral "0" and between the letter "I" and the number "1." (3) Tests indicate it is just as easy to remember a seven-digit number as a telephone number that has two letters and five numbers for short periods of time (such as between looking up the number in the directory and dialing it). (4) In larger exchanges, it precludes misspelling of prefix names, and misunderstanding of words that sound phonetically alike. Jenner said that work has already started in subscribers' homes and businesses either to change the telephone instrument or to modify it for dial telephone service. Nearly half of this job is completed. He also pointed out that subscribers shortly will receive a booklet showing them how to use their new dial service, DDD, and All Number Calling. As a final reminder, Jenner said that when Newhall exchange telephone users get the new dial service it will be necessary to dial all seven digits for local calls; the area code (like "213" for L.A.), prefix (like MA) and five digits for long distance calls placed out of the Newhall code area. DDD map illustrates just a few of the more than 150 area numbering plan combinations that can be dialed direct by Newhall long distance users this coming June with Direct Distant Dialing. DDD will enable a subscriber with just three extra spins of the dial to call nation-wide in second[s] to more than 50 million telephones without help from an operator.